For other uses, see Paranormal (disambiguation). Proposals regarding the paranormal are different from scientific hypotheses or speculations extrapolated from scientific evidence because scientific ideas are grounded in empirical observations and experimental data gained through the scientific method. In contrast, those who argue for the existence of the paranormal explicitly do not base their arguments on empirical evidence but rather on anecdote, testimony, and suspicion. Notable paranormal beliefs include those that pertain to telepathy, extrasensory perception, spiritualism and the pseudosciences of ghost hunting, cryptozoology, and ufology. The belief in ghosts as souls of the departed is closely tied to the concept of animism, an ancient belief which attributed souls to everything in nature. As the 19th-century anthropologist George Frazer explained in his classic work, The Golden Bough (1890), souls were seen as the creature within that animated the body. [page needed] Although the human soul was sometimes symbolically or literally depicted in ancient cultures as a bird or other animal, it was widely held that the soul was an exact reproduction of the body in every feature, even down to clothing the person wore. This is depicted in artwork from various ancient cultures, including such works as the ancient Egyptian Book of the Dead (ca. (1550 BCE), which shows deceased people in the afterlife appearing much as they did before death, including the style of dress. Cryptozoology is a pseudoscience and subculture that aims to prove the existence of entities from the folklore record, such as Bigfoot, chupacabras, or Mokele-mbembe. Cryptozoologists refer to these entities as cryptids, a term coined by the subculture. Charles Fort (1874–1932) is perhaps the best-known collector of paranormal anecdotes. Fort is said to have compiled as many as 40,000 notes on unexplained paranormal experiences, though there was no doubt many more. These notes came from what he called "the orthodox conventionality of Science", which were odd events originally reported in magazines and newspapers such as The Times and scientific journals such as Scientific American, Nature and Science. From this research Fort wrote seven books, though only four survive: The Book of the Damned (1919), New Lands (1923), Lo! (1931) and Wild Talents (1932); one book was written between New Lands and Lo!, but it was abandoned and absorbed into Lo! Reported events that he collected include teleportation (a term Fort is generally credited with coining); poltergeist events; falls of frogs, fishes, and inorganic materials of an amazing range; crop circles; unaccountable noises and explosions; spontaneous fires; levitation; ball lightning (a term explicitly used by Fort); unidentified flying objects; mysterious appearances and disappearances; giant wheels of light in the oceans; and animals found outside their normal ranges (see phantom cat). He offered many reports of OOPArts, the abbreviation for "out of place" artefacts: strange items found in unlikely locations. He is perhaps the first person to explain strange human appearances and disappearances by the hypothesis of alien abduction and was an early proponent of the extraterrestrial hypothesis. It was also realized that people with higher dopamine levels have the ability to find patterns and meanings where there aren't any. This is why scientists have connected high dopamine levels with paranormal belief. While the validity of the existence of paranormal phenomena is controversial and debated passionately by both proponents of the paranormal and by skeptics, surveys are useful in determining the beliefs of people in regards to paranormal phenomena. These opinions, while not constituting scientific evidence for or against, may give an indication of the mindset of a certain portion of the population (at least among those who answered the polls). The number of people worldwide who believe in parapsychological powers has been estimated to be 3 to 4 billion. A survey conducted in 2006 by researchers from Australia's Monash University sought to determine what types of phenomena that people claim to have experienced and the effects these experiences have had on their lives. The study was conducted as an online survey with over 2,000 respondents from around the world participating. The results revealed that around 70% of the respondents believe to have had an unexplained paranormal event that changed their life, mostly in a positive way. About 70% also claimed to have seen, heard, or been touched by an animal or person that they knew was not there; 80% have reported having a premonition, and almost 50% stated they recalled a previous life. In 2017 the Chapman University Survey of American Fears asked about seven paranormal beliefs and found that "the most common belief is that ancient advanced civilizations such as Atlantis once existed (55 percent). Next was that places can be haunted by spirits (52 percent), aliens have visited Earth in our ancient past (35 percent), aliens have come to Earth in modern times (26 percent), some people can move objects with their minds (25 percent), fortune tellers and psychics can survey the future (19 percent), and Bigfoot is a real creature. Only one-fourth of respondents didn't hold at least one of these beliefs." ^ Also includes the effect of placebo through "power of the human mind to heal the body". ^ Some may have taken this metaphorically. ^ "Belief in the Paranormal or Pseudoscience". Nsf.gov. Archived from the original on 4 February 2012. Retrieved 7 March 2012. ^ "Paranormal". The Free Dictionary. Retrieved 3 February 2008. ^ "Paranormal". Merriam-Webster Dictionary. Merriam-Webster. ^ Parapsychological Association. "Paranormal". Glossary of key words frequently used in parapsychology. Retrieved 13 December 2006. ^ "Ghost". The Free Dictionary. Retrieved 13 December 2006. ^ a b c Melton, J. Gordon. "Animism". Encyclopedia of Occultism & Parapsychology'. Gale Research. ISBN 0-8103-5487-X. ^ "NASA Scientists To Discuss Search For Extraterrestrial Life". Spacedaily.com. Retrieved 15 June 2014. ^ Freudenrich, Craig (8 May 2001). "HowStuffWorks "How SETI Works"". Howstuffworks.com. Retrieved 15 June 2014. ^ a b Brenda Denzler. The Lure of the Edge: Scientific Passions, Religious Beliefs, and the Pursuit of UFOs. Univ of California Press; 7 November 2001. ISBN 978-0-520-22432-2. p. 67–. ^ Susanna Hornig Priest. Encyclopedia of Science and Technology Communication. SAGE; 14 July 2010. ISBN 978-1-4129-5920-9. p. 918–. ^ Gulliksen, Harold. (1938). "Extra-Sensory Perception: What Is It?". American Journal of Sociology. Vol. 43, No. 4. pp. 623–634. "Investigating Rhine's methods, we find that his mathematical methods are wrong and that the effect of this error would in some cases be negligible and in others very marked. We find that many of his experiments were set up in a manner which would tend to increase, instead of to diminish, the possibility of systematic clerical errors; and lastly, that the ESP cards can be read from the back." ^ Wynn, Charles; Wiggins, Arthur. (2001). Quantum Leaps in the Wrong Direction: Where Real Science Ends ... and Pseudoscience Begins. Joseph Henry Press. p. 156. ISBN 978-0-309-07309-7 "In 1940, Rhine coauthored a book, Extrasensory Perception After Sixty Years in which he suggested that something more than mere guess work was involved in his experiments. He was right! It is now known that the experiments conducted in his laboratory contained serious methodological flaws. Tests often took place with minimal or no screening between the subject and the person administering the test. Subjects could see the backs of cards that were later discovered to be so cheaply printed that a faint outline of the symbol could be seen. Furthermore, in face-to-face tests, subjects could see card faces reflected in the tester's eyeglasses or cornea. They were even able to (consciously or unconsciously) pick up clues from the tester's facial expression and voice inflection. In addition, an observant subject could identify the cards by certain irregularities like warped edges, spots on the backs, or design imperfections." ^ Hines, Terence. (2003). Pseudoscience and the Paranormal. Prometheus Books. p. 122. ISBN 1-57392-979-4 "The procedural errors in the Rhine experiments have been extremely damaging to his claims to have demonstrated the existence of ESP. Equally damaging has been the fact that the results have not replicated when the experiments have been conducted in other laboratories." ^ Kurtz, Paul. (September 2006). Science and the Public: Summing Up Thirty Years of the Skeptical Inquirer. Skeptical Inquirer 30 (5): 13-19. ^ Stenger, Victor J. (1990). Physics and Psychics: The Search for a World Beyond the Senses. Prometheus Books. p. 192. ISBN 978-0-87975-575-1 "Today, parapsychology is widely regarded as a pseudoscience.... Over a century it has been tainted by fraud, incompetence, and a general unwillingness to accept the verdict of conventional scientific method." ^ Pigliucci, Massimo; Boudry, Maarten. (2013). Philosophy of Pseudoscience: Reconsidering the Demarcation Problem. University Of Chicago Press p. 158. ISBN 978-0-226-05196-3 "Many observers refer to the field as a 'pseudoscience'. When mainstream scientists say that the field of parapsychology is not scientific, they mean that no satisfying naturalistic cause-and-effect explanation for these supposed effects has yet been proposed and that the field's experiments cannot be consistently replicated." ^ Hines, Terence. (2003). Pseudoscience and the Paranormal. Prometheus Books. p. 144. ISBN 1-57392-979-4 "It is important to realize that, in one hundred years of parapsychological investigations, there has never been a single adequate demonstration of the reality of any psi phenomenon." ^ Cordón, Luis A. (2005). Popular Psychology: An Encyclopedia. Greenwood Press. p. 182. ISBN 0-313-32457-3. "The essential problem is that a large portion of the scientific community, including most research psychologists, regards parapsychology as a pseudoscience, due largely to its failure to move beyond null results in the way science usually does. Ordinarily, when experimental evidence fails repeatedly to support a hypothesis, that hypothesis is abandoned. Within parapsychology, however, more than a century of experimentation has failed even to conclusively demonstrate the mere existence of paranormal phenomenon, yet parapsychologists continue to pursue that elusive goal." ^ a b c Oling-Smee, L (1 March 2007). "The lab that asked the wrong questions". Nature. 446 (7131): 10–1. Bibcode:2007Natur.446...10O. doi:10.1038/446010a. PMID 17330012. ^ "Paranormal Groups". Ghostvillage.com. Retrieved 15 June 2014. ^ Caso, Alvaro. "Three Skeptics' Debate Tools Examined". Skeptical Inquirer, Volume 26, No 1, pp 37–41, January–February 2002. ^ a b Marks, D. F. (1988). The psychology of paranormal beliefs. Experientia 44: 332-337. ^ a b c d e Richard Wiseman (2011). "The Haunted Brain". 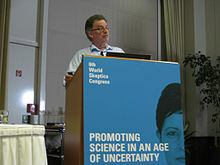 www.csicop.org. Retrieved 7 January 2019. ^ Schmaltz R. M; Lilienfeld, S. O. (2014). Hauntings, homeopathy, and the Hopkinsville Goblins: Using pseudoscience to teach scientific thinking. Frontiers in Psychology. 5: 336. ^ Alcock, James. (1981). Parapsychology-Science Or Magic? : A Psychological Perspective. Pergamon Press. pp. 139–140. ISBN 978-0080257730 "It was through the diligent efforts of conjurer James ('The Amazing') Randi that Geller was finally, at least in most people's eyes, exposed. Randi demonstrated that he could by ordinary conjuring means duplicate Geller's feats. His perseverance in investigating and unveiling the circumstances of many of Geller's more spectacular performances (including the discovery of confederates who aided Geller when necessary) made it very difficult for anyone with any degree of critical thought to continue to accept Geller's claims." ^ Hurley, Patrick J. (2010). A Concise Introduction to Logic. 11th Edition. Wadsworth Publishing. p. 626. ISBN 978-0840034168 "In fact Geller was just a clever trickster who duped his audiences. Geller's trickery was exposed in large measure by the magician James Randi. After watching videotapes of Geller's performances, Randi discovered how Geller performed his tricks, and in no time he was able to perform every one of them himself. Sometimes Geller would prepare a spoon or key beforehand by bending it back and forth several times to the point where it was nearly ready to break. Later, by merely stroking it gently, he could cause it to double over. On other occasions Geller, or his accomplices, would use sleight-of-hand maneuvers to substitute bent objects in the place of straight ones." ^ "The Million Dollar Challenge". James Randi Education Foundation. ^ Wiseman, Richard; Watt, Caroline (2006). "Belief in psychic ability and the misattribution hypothesis: A qualitative review" (PDF). British Journal of Psychology. 97 (3): 323–38. CiteSeerX 10.1.1.537.3311. doi:10.1348/000712605X72523. PMID 16848946. ^ van Elk, Michiel (2003). "Paranormal believers are more prone to illusory agency detection than skeptics". Consciousness and Cognition. 22 (3): 1041–46. doi:10.1016/j.concog.2013.07.004. PMID 23933505. ^ French, C. C., & Wilson, K. (2007). "Cognitive factors underlying paranormal beliefs and experiences". In S. Della Sala (ed.). Tall Tales About the Mind and Brain: Separating Fact From Fiction. Oxford: Oxford University Press. Chapter 1, pp. 3–22. ^ Willard A., & Norenzayan, A. (2013). "Cognitive biases explain religious belief, paranormal belief, and belief in life's purpose". Cognition 129: 379-91. ^ Rattet, S. L. & Bursik, K. (2001). "Investigating the Personality Correlates of Paranormal Belief and Precognitive". Experience. Personality and Individual Differences, 31, 433–444. ^ Wiseman, Richard; Greening, Emma; Smith, Matthew (2003). "Belief in the paranormal and suggestion in the seance room" (PDF). British Journal of Psychology. 94 (3): 285–297. CiteSeerX 10.1.1.528.2693. doi:10.1348/000712603767876235. ISSN 2044-8295. PMID 14511544. ^ Wolfradt, U. (1997). "Dissociative Experiences, Trait Anxiety and Paranormal Beliefs". Personality and Individual Differences, 23, 15–19. ^ Bainbridge, W. S. (1978). "Chariots of the gullible". Skeptical Inquirer, 3, 33–48. ^ Wuthnow, R. (1976). "Astrology and marginality". Journal for the Scientific Study of Religion, 15, 157–168. ^ Otis, L. P., & Alcock, J. (1982). "Factors affecting extraordinary belief". Journal of Social Psychology, 118, 77–85. ^ Smith, M. D., Foster, C. L., & Stovin, G. (1998). "Intelligence and paranormal belief: Examining the role of context". Journal of Parapsychology, 62, 65–77. ^ Blum, S. H. & Blum, L. H. (1974). "Do's and Dont's: An Informal Study of some Prevailing Superstitions". Psychological Reports, 35, 567-571. ^ Jahoda, G. (1970). "Supernatural Beliefs and Changing Cognitive Structures among Ghanaian University Students". Journal of Cross-Cultural Psychology, 1, 115–130. ^ Killen, P., Wildman, R. W. & Wildman, R. W. II (1974). "Superstitiousness and Intelligence". Psychological Reports, 34, 1158. ^ Tobacyk, J. J. (1984). "Paranormal belief and college grade point average". Psychological Reports, 54, 217–218. ^ Messer, W. S., & Griggs, R. A. (1989). "Student belief and involvement in the paranormal and performance in introductory psychology". Teaching of Psychology, 16, 187–191. ^ Gow, K., Lang, T. and Chant, D. (2004). "Fantasy proneness, paranormal beliefs and personality features in out-of-body experiences". Contemp. Hypnosis, 21: 107–125. ^ Irwin, H. J. (1994). "Paranormal belief and proneness to dissociation". Psychological Reports, 75, 1344–1346. ^ Tobayck, J. & Milford, G. (1983). "Belief in paranormal phenomena: assessment instrument development and implications for personality functioning". Journal of Personality and Social Psychology, 44, 1029–1037. ^ Roig, M., Bridges, K. R., Renner, C. H. & Jackson, C. R. (1998). "Belief in the paranormal and its association with irrational thinking controlled for context effects". Personality and Individual Differences, 24 (2), 229–236. ^ Wierzbicki, M. (1985). "Reasoning errors and belief in the paranormal". Journal of Social Psychology, 125, 489–494. ^ Roe, C. A. and Morgan, C. L. (2002). "Narcissism and belief in the paranormal". Psychological Reports, 90, 405–411. ^ Boer de R. & Bierman, D. J. (2006). "The roots of paranormal belief: Divergent associations or real paranormal experiences?" Proceedings of the PA 2006 Convention, 283–298. ^ Lawrence, E., & Peters, E. (2004). "Reasoning in believers in the paranormal". Journal of Nervous & Mental Disease, 192, 727–733. ^ French, C. C., Santomauro, J., Hamilton, V., Fox, R., & Thalbourne, M. (2008). "Psychological aspects of the alien contact experience". Cortex. 44, 1387–1395. ^ Perkins SL, Allen R. (2006). Childhood physical abuse and differential development of paranormal belief systems. The Journal of Nervous and Mental Disease 194: 349-355. ^ French, C. C., & Kerman, M. K. (1996). "Childhood trauma, fantasy proneness and belief in the paranormal". Paper presented to the 1996 London Conference of the British Psychological Society, Institute of Education, University of London, 17–18 December 1996. ^ Lawrence. T., Edwards, C., Barraclough, N., Church S., & Hetherington, F. (1995). "Modelling childhood causes of paranormal belief and experience: Childhood trauma and childhood fantasy". Personality and Individual Differences, 19(2), 209–215. ^ Ross, C. A. & Joshi, S. "Paranormal Experiences in the General Population". Journal of Nervous and Mental Disease. 180, 357–361. ^ Blackmore, S. J., & Troscianko, T. (1985). "Belief in the paranormal: probability judgements, illusory control and the 'chance baseline shift'". British Journal of Psychology. 76, 459–468. ^ Clarke, D. (1991). "Belief in the paranormal: a New Zealand survey". Journal of the Society for Psychical Research, 57, 412–425. ^ Rice, T. W. (2003). "Believe it or not: religious and other paranormal beliefs in the United States". Journal for the Scientific Study of Religion, 42, 95–106. ^ Tobacyk, J. J., Nagot, E., & Miller, M. (1988). "Paranormal beliefs and locus of control: A Multidimensional examination". Journal of Personality Assessment, 54, 241–246. ^ Otis, L. P., & Kuo, E. C. Y. (1984). "Extraordinary beliefs among students in Singapore and Canada". Journal of Psychology, 116, 215–226. ^ Chang, Kenneth. "Do Paranormal Phenomena exist?". The New York Times. Retrieved 4 October 2013. ^ Elk, Michiel van. (2013). 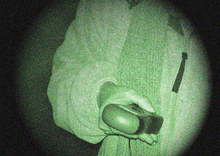 Paranormal believers are more prone to illusory agency detection than skeptics. Consciousness and Cognition 22: 1041–1046. ^ Shiah YJ, Wu YZ, Chen YH, Chiang SK. (2014). "Schizophrenia and the paranormal: More psi belief and superstition, and less déjà vu in medicated schizophrenic patients". Comprehensive Psychiatry 55: 688-92. ^ Raz, A., Hines, T., Fossella, J., & Castro, D. (2008). Paranormal experience and the COMT dopaminergic gene. A preliminary attempt to associate phenotype with using an underlying brain theory. Cortex, 44: 1336-1341. ^ Schulter, G. & Papousek, I. (2008). "Believing in paranormal phenomena: Relations to asymmetry of body and brain". Cortex, 44, 1326–1335. ^ Phillips, Helen. "Paranormal beliefs linked to brain chemistry". New Scientist. New Scientist. Retrieved 4 October 2013. ^ Barry Singer and Victor A. Benassi. "Occult Beliefs: Media distortions, social uncertainty, and deficiencies of human reasoning seem to be at the basis of occult beliefs". American Scientist, Vol. 69, No. 1 (January–February 1981), pp. 49-55. ^ Massimo Pigliucci; Maarten Boudry (16 August 2013). Philosophy of Pseudoscience: Reconsidering the Demarcation Problem. University of Chicago Press. p. 155. ISBN 978-0-226-05182-6. ^ a b ABC Science Online. "News in Science - 'Spooky survey' gets big response - 17/11/2006". Abc.net.au. Retrieved 15 June 2014. ^ a b c "Smart People See Ghosts", Brad Steiger, Fate Magazine, April 2006, p. 52-56; the unusual thing found by Farha and Steward was that belief in the supernatural increased with education level, contrary to many other surveys. However, that aspect of their study is not being used here. ^ a b c W. Moore, David (16 June 2005). "Three in Four Americans Believe in Paranormal". Gallup. Retrieved 19 September 2013. ^ ""Science and Technology: Public Attitudes and Understanding-Public Knowledge About S&T", Chapter 7 of Science and Engineering Indicators 2004, National Science Board, National Science Foundation". Nsf.gov. Archived from the original on 18 August 2015. Retrieved 7 March 2012. ^ "Chapman Survey 2017: Advanced Ancient Civilizations, Spirits, Alien Visits Remain Top Paranormal Beliefs". Skeptical Inquirer. 42 (1): 5. 2018. ^ "Randi $1,000,000 paranormal challenge". The Skeptic's Dictionary. Retrieved 3 February 2008. ^ Larsen, Claus (September 2003). "Get Rich Quick or Save the World". Skeptic Report. Archived from the original on 23 March 2007. Retrieved 7 March 2007. ^ Independent Investigations Group. "Investigations". Retrieved 11 April 2012. Wikivoyage has a travel guide for Myths and legends.